Oh so many recipes to share! This week my menu planning for has been very exciting. We ate leftovers (garbanzo pesto soup) from last week's guest menu two days out of the week. Then I made a Sweet Potato Soup inspired by this post at one of my favorite new blogs, Sweet Mama Jane's. On Thursday night I made this amazing Tomato Pie that I discovered on Janssen's Everyday Reading and she via Perry's Plate. This pie was delicious and because I didn't think my kids would really enjoy the combination of flavors I made them something else and served the pie just to my husband and I, date style, after he got home from a late meeting. He loved it and I shared a piece with my co-worker, Janice, and she asked for the recipe. This pie was quite perfect as it was but I could imagine it with sprinkles of local bacon under the cheesy/mayo topping. The pie had a BLT quality and this got my mind thinking about bacon. It is a virtual cornucopia of recipe sharing out there. It is so easy to pick and plan when there are such a wide variety of recipes around! I find much of my inspiration on the internet, googling ingredients to find a recipe or from blog posts but I've also turned inward toward my own cookbook collection to new and favorite recipes. Friday night, with a little extra time on my hands, I used the last of Janice's cherry tomato bounty, which she shared with me, to make Giada's Cheeca Sauce and tossed it with spiral pasta. Shocking was the fact that Groovy Girl hated it. She said the orange cherry tomatoes taste funny to her. Seriously. I found this Potato Pancake with Cinnamon Apples in a Tyler Florence book from my own cookbook shelf and I plan to make it this coming week. I love apple season. 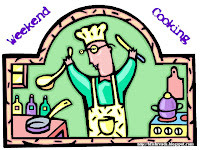 Weekend Cooking is hosted by Beth Fish Reads-pop over and see many other food related posts.